We dream of a day when the cycle of poverty is broken in Haiti, and The 610 Project is working hard to make this dream a reality. We believe the key is education. Join in the journey for as little as $5 monthly as we build a new school in Les Cayes, Haiti and continue to support education at an existing school in Croix des Bouquets. Together we can educate a generation. Les Cayes is the site of our future school and guest house, being built in partnership with Haitian American Caucus. With almost 7 acres of land in rural Morne Brieux, this campus will be home to 250+ students annually, will house adult vocational and literacy programs, and offer workspace for further Microenterprise development. Just under 7 acres will soon be home to a brand new school and guest house, offering education to hundreds of students and adults in rural communities. We currently work with a sewing group of 45 skilled women and men in Les Cayes to develop and ensure steady work flow, fair wages, and skills-training. We work in close partnership with Haitian American Caucus in Croix des Bouquets to support educational initiatives at their existing campus for over 500 students. 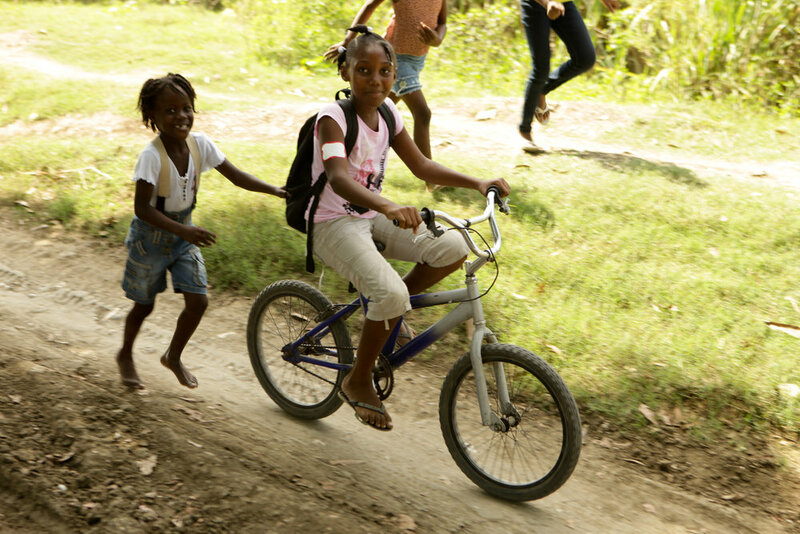 So many schools and orphanages don't have a way of offering recreation or transportation to their kids. We help with that by working with The Spinning Spoke Cycle Hub in Florence, AL to restore donated bikes and get them into the hands of organizations and kids who need them most. For the first time, our students have been able to have the full school picture and yearbook experience. Not only did our team photograph and print each child's picture, but Balfour Yearbooks printed hard-bound books for each HAC student. The formation of a student-led yearbook staff additionally offers students experience in writing, editing, and photography. Music Education offers students greater cognitive development, problem-solving skills, creative outlets, and for many the chance of higher education scholarships. We will be launching music ed at HAC in January 2019 with beginning band camp and the school's first ever concert band.